Today we released initial findings on TV ratings, audience size and demographics following the first games of the 2014 FIFA World Cup. The data, gathered via mobile surveys in Ghana, Kenya, Nigeria, Tanzania and Uganda, provides a first-ever glimpse of the fans who are tuning into the World Cup in these countries. Below is a breakdown of our most interesting findings, and read the full press release here. 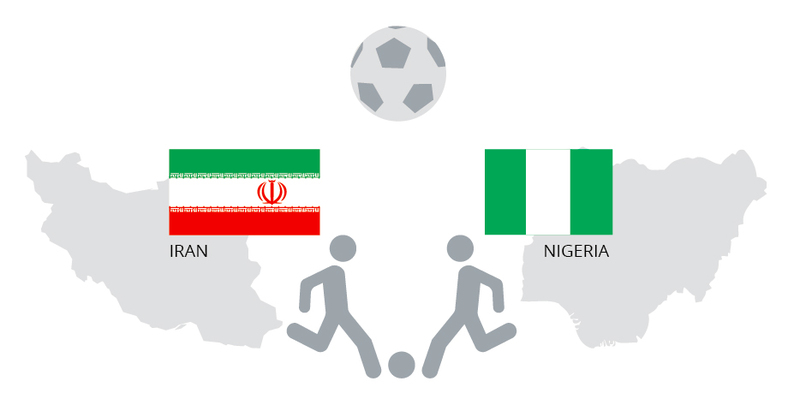 Nigeria v. Iran game watched by millions – The game between Nigeria and Iran, played during prime time in Nigeria, drew 17.5 million Nigerian adult viewers or 20% of the Nigerian adult population. More than 25 million adults from all the surveyed African nations watched the Nigeria game, making it the most watched game in these markets over the first 5 days of play. Ghana’s World Cup viewership stays high across games – Ghana viewership has remained high across all games: 3.5 million watched the opening game between Brazil and Croatia, and the gripping match between Ghana and the United States on Monday attracted 2.4 million adult Ghanaian viewers. The U.S./Ghana game aired at 10pm Ghana time, which might explain the drop in viewership numbers in the country, compared to the earlier Monday games which saw 3.1 million Ghanaian viewers. On average across the first 5 days of games, 2.2 million Ghanaians have tuned in to every hour of play. Strong enthusiasm for soccer across African countries – At peak viewership, during the Nigeria/Iran game, about 15% of adults aged 15+, or 25 million total across Ghana, Kenya, Nigeria, Tanzania and Uganda, were watching the games. Nigeria had the highest total viewership numbers, with 17.5 million. Both Nigeria and Ghana have had consistently high percentages of their adult population watching the games: an average of 14% per game for Ghana and 10% per game for Nigeria. Youths have been particularly interested in the games – In Ghana 1.7 million people aged 15-24 tuned in to the Germany-Portugal game, or about 18% of the youth population. In Kenya almost 900,000 aged 15-24 watched the same game, and in Nigeria 3.5 million youths were watching. Gender differences apparent across countries – In Ghana, more males watch the games: for the first 5 days of game play the gender split was an average of 28% female to 72% male. In Nigeria, the gender split for the World Cup games is less dramatic than in other countries: about 38% female to 62% male. Interested in using GeoPoll’s Audience Measurement Service for your own data needs?